While Heather and I were away on vacation we heard the news about the violence perpetrated by white supremacists in Charlottesville, Virginia, resulting in loss of life, and numerous physical injuries. Though we were away on vacation, we were filled with sorrow and praying with you from afar. We were reminded of just how deep and enduring the power of white supremacy is in this country. I say “reminded” because as white folks, we tend to forget just how saturated our country is with white supremacy. Those of us classified as white have to do a lot of work to notice white supremacy, because we are blind to it so much of the time. People of color don’t have that option. They are not only aware of the power of this evil force, their bodies are repeatedly under attack because of it. Over the recent couple weeks the term “white supremacy” has made headlines in the news. And it is encouraging to see religious leaders and politicians from various faiths and political parties denounce overt expressions of racist violence in our country. We must do this. We haven’t always done it, but as a church we must denounce racism. We must call it for what it is: A sin. A sin that is in complete opposition to the gospel we know in Jesus Christ. We must denounce it publicly, in our churches and in our homes. What I think is the greater challenge for us as followers of the Black Jesus is our commitment to the long haul work of racial justice. Will we consistently denounce and repent of our racism both within our hearts and in the basic structures of our system? Will we actually roll up our sleeves and work to change the system? Will we do this work when white supremacy makes the headlines, but also and perhaps especially, when it does not? I am learning that as a person classified as white, I am going to need to wrestle with and repent from racism my whole life long. Hate groups are growing in our country today. The numbers of people joining white nationalists groups are growing. This is frightening. And the people under greatest attack (still) are people of color, and in the U.S. especially, Muslims. People of color and Muslims face the real threat of racist violence every day. If the gospel of Jesus Christ means anything to us at all, if our faith has any real power and hope to offer, we cannot be silent. We must denounce racism today, tomorrow and beyond–in our own hearts and in our systems, in private, in public, in our families, in our communities and in our churches. We need to help each other in this work. May God’s peace and power and courage fill you and all of us today. As we move into the fall, there are lots of ways that you can be involved with music at TAB. Consider singing with the TAB Songleaders, a group that rehearses before select Sunday services to add beauty and leadership to music and worship. This group helps the congregation learn new songs and enhance our music. If interested, there is absolutely no obligation to sing every Songleader Sunday—only when it works for you! We will start rehearsing again in the fall, but for now, I'll make sure you are included in the email invitations. If you're an instrumentalist or vocal soloist, your gifts are very welcome in Sunday morning worship. Do you have interest in playing prelude and offertory? Playing or singing with me on songs or special music? I'm grateful for your gifts and would love to find ways for you to share them with the TAB community. To contact me about these opportunities or to ask questions, don't hesitate to reach out to Pax (they/them). Thank you! For this year's stewardship season we are looking to have Tab members and friends share something they'd like to thank the church for. Is there a Tab mission partner that you're grateful we support? Is there something in the budget that really matters to you? Are there tasks people volunteer to do that make church a place you want to be? For example, I'd like to share how grateful I am that we have a paid nursery care provider--it helps SO much! If you are willing to share in front of the congregation on a Sunday in October please let Lucinda know (ms.megill@gmail.com or 202-997-9377). Or, if you'd rather share your thoughts in a written form to be used for either the stewardship letter or annual report --we would be glad for those as well. Paul sends his love: a study of I Corinthians. The Bible study group will be exploring 1 Corinthians this fall. Come join us! 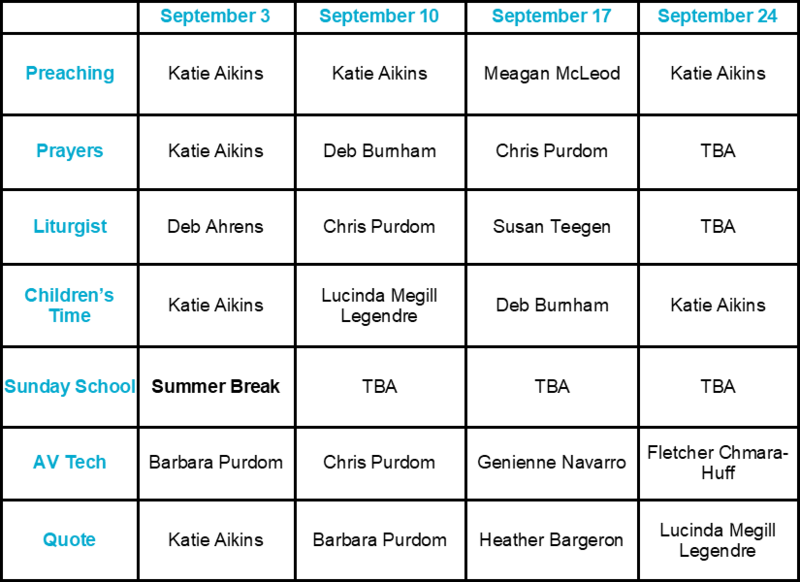 The dates and chapters for September are: Sept 10: Introduction and I Corinthians 1:1 - 3:25; Sept 24: i Corinthians 4:1 - 6:20. We meet from 5:30-7pm in the Community Room at Tabernacle. Speak with Jean Erb or Pastor Katie if you have any questions. Tab has a new Office Manager! Chelle (Michelle for long) has lived on both coasts and a few points in between, but quite happily decided on Philadelphia several years ago. Putting her masters degree in International Relations to good use, she’s worked in church administration for over five years, likes to read (everything), write (fiction), and will gladly give you her opinion on folk music, sour beers, and the correct pronunciation of GIF if you’re interested. 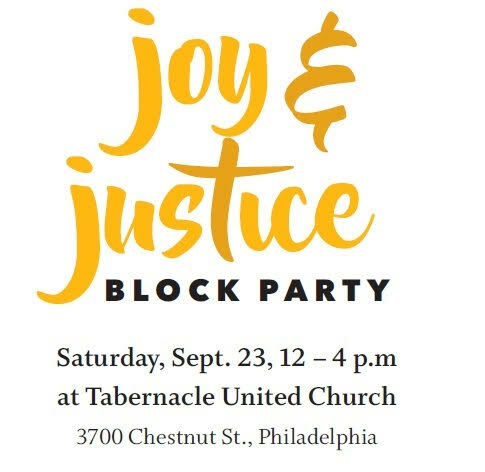 Joy & Justice Block Party! In the face of times of trial that cause us to despair having hope and being joyful are part of following a living God! So, Tabernacle's gonna party in the street! Come and join us! Bring a friend, invite a neighbor! There will be lots to do to help us have a great party--wanna bring a dish, lead an activity, play some tunes, set up chairs, etc. Contact Lucinda Megill Legendre or any member of Council to help. Our 300th Anniversary as a Presbytery. We celebrate the 300th Anniversary of the Presbytery of Philadelphia on Saturday, October 7, from 10am to 2pm. The Worship Celebration will be held at Enon Tabernacle Baptist Church, 2800 West Cheltenham Ave., where there is substantial space as well as substantial parking. The 10am Service and Music will be followed at Noon by post-event fellowship and reception. More information to come as the event approaches, and look for flyers on upcoming Sundays at the Greeters Table. Pray! Continue to pray for survivors and responders. Give! Financial contributions following disasters allow for flexibility in responding to the need at hand. Donate! Collect items to assemble CWS cleanup buckets. Engage local businesses, friends, family and coworkers. Don’t forget that UCC Disaster Ministries has matching grants to assist you. September 3: G(reet)E(at)M(eet) Potluck - No Tab.edu scheduled. Join Pastor Katie for a discussion on the last sermon in our series on the Ten Commandments. We will talk about what we’ve learned, what remains challenging for us, and any reflections or questions you bring from the series this summer. 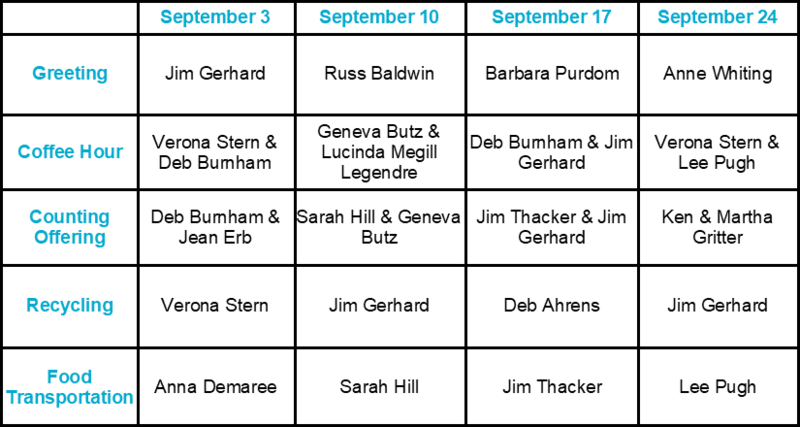 September 17: Portraits of Professional Caregivers with Vic Compher. Last spring, Vic Compher screened his film, “Portraits of Professional Caregivers: Their Passion. Their Pain.” Through dramatic stories the film addresses the often hidden emotional impacts that professionals may experience who provide care to traumatized or suffering people. A range of professionals are featured including teachers, therapists, nurses, social workers, hospice staff, first responders, firefighters and police. The film also illustrates ways to nurture wellness and meaning in one’s role as a care provider. Septemer 24: Welcome back Potluck Brunch – No Tab.edu scheduled. + Bread donated by Four Worlds Bakery, 47th & Woodland. ; it should be picked up the day before. You're receiving this email because you're subscribed to the Tabernacle United listserv or you signed up to receive the Tabernacle United Newsletter. Copyright © 2017 Tabernacle United Church, All rights reserved.